The ballots are now open and it is your chance to support those people who spend their hard earned spare time crafting and shaping freeness for your gaming delight! The Quick Start rules are little more than advertising material, so let's give those who create for free a chance. Ballots close on the 1st of August! 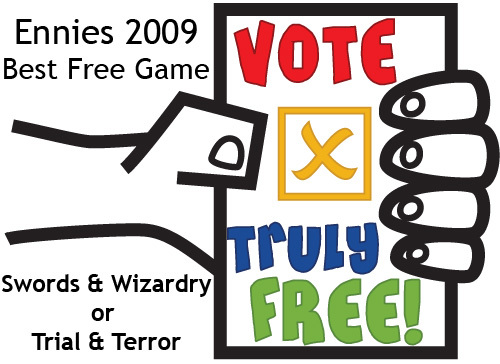 Vote for Trial and Terror or Swords and Wizardry! Next year, I am going to do whatever is necessary to ensure that this category is filled with truly free delights. Actually the campaigning went well. I got lots of coverage but more importantly, Swords and Wizardry won! No doubt it was down to a solid product and a team of nearly frother obsessives that got it there but it was good to see it win. 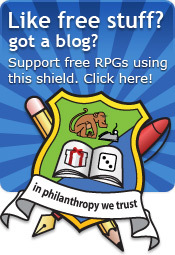 Lots of prominent bloggers put the logo up onto their blogs (in some cases, I had to ask them to replace it with the philanthropy one long after the event).